Imprinting standard legend stock, membership, etc. certificates enables us to provide fast service at low cost. We imprint standard legend certificates with the entity name, one class capitalization, state and officers' titles. 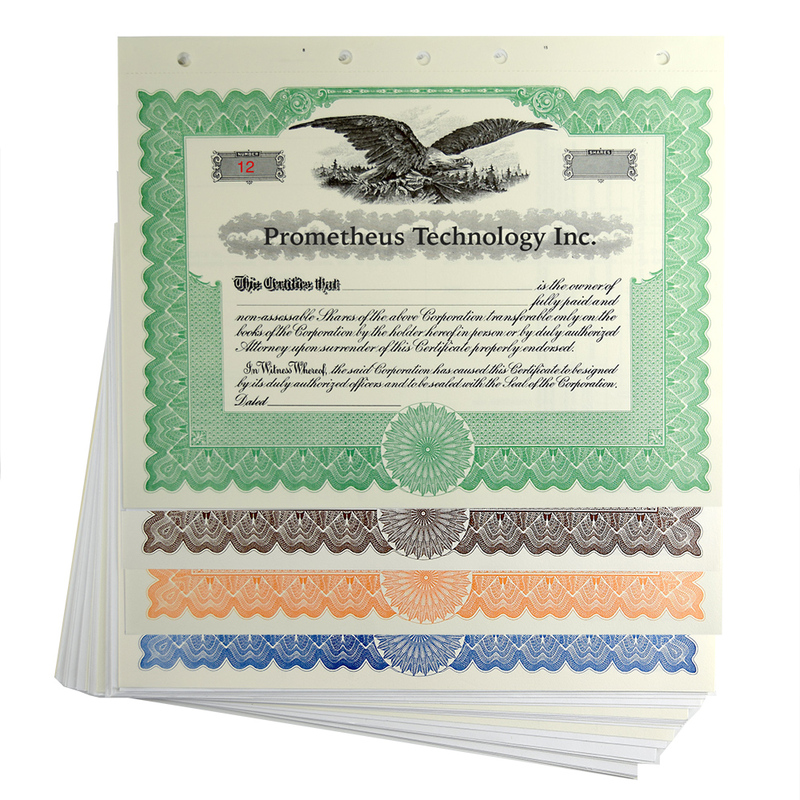 Shareprinter™ prints in the fields of the preprinted story that appears on the certificates that come with our corporate, LLC and LP kits or on imprinted certificates ordered without the kit. It does not print the entity name, capitalization, etc. because they are imprinted in the story in our plant. It fills in the name of the holder, prints the number of shares/units in the certificate box, spells out the number in the story, then prints same on the stub. It is not intended for use with blank bordered certificates, or certificates with story of styles that are not included with kits. – Dates the certificate and stub automatically. – For single class BlumbergExcelsior certificates. Important: to use the TEMPLATE, request loose (not bound) certificates and stubs when you place a corporate kit or certificate order. Do you require multiple-class stock or ownership certificates? Fair notice considerations embodied in most state corporate statutes set minimum criteria for the printing of multiple-class share certificates. In addition to essential information necessary on single-class certificates, the shares of each class of a multiple-class corporation must have specific information printed on them. Read our free paper, "How To Order Multiple-Class Certificates." Call 800 221-2972. Ask for a certificate specialist. Make an impact! Add your logo in color to your certificates. *These files require a resolution of at least 300 dpi (dots per inch) at 100% of the final print size. (A higher resolution means a more detailed printed image.) The recommended resolution is 1024 X 1024 at 300 DPI.